Hi friend! I hope you’ve been having a splendiferous week! I just returned to Saskatoon late on Tuesday night after 5 weeks of exploring 4 provinces and I must admit I’m wiped. No rest for the wicked though. Since my internal clock is set on Ontario time I got up extra early today and put in a super productive 14 hour work day writing articles for Aloha Way, running a huge pile of errands, and getting ready for the Yoga at the Ridge Retreat this weekend, at which I’m not only presenting, but am also catering one of the dinners! I’ve been roasting beets and listening to my favourite high school bands all night while listening to the merry makers on Broadway soaking in the Fringe fest. 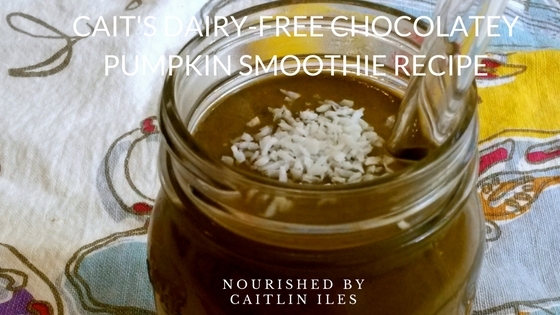 The final batch just came out though, so I thought I’d whip up a little post and realized I never shared this super delicious awesome Dairy-Free Chocolatey Pumpkin Smoothie Recipe that I created a couple of months ago. It’s got chocolate in it, so really it sells itself. Let’s take a look at the finer print. I typically go for an organic raw cacao powder or an organic roasted cocoa powder. Dutch cocoa, a process by which the raw cacao is treated with an alkalizing agent to lower acidity, can decrease the antioxidant content of cocoa by up to 60-90%. In order to get the maximum antioxidant benefits we’ll want to avoid Dutch cocoa in most of our chocolate bevvies and treats. Cocoa/cacao is an amazing source of antioxidants, in the form of polyphenols and flavanols, and is one of the highest food sources of magnesium. It also contains certain amino acids such as phenylalanine, tyrosine, and L-tryptophan that are precursors to dopamine and serotonin, respectively, and so help boost levels of these neurotransmitters in the brain. Pumpkins, and other members of the winter squash family, are a fantastic source of beta and alpha carotenes, lutein, zeaxanthin, and beta-cryptoxanthin. Beta-carotene is converted to vitamin A in the body, while the rest of these nutrients act as awesome antioxidants in our bodies, protecting us from free radical damage and keeping us looking young and fresh. Though pumpkin does contain a fair amount of carbohydrates, the specific type of polysaccharides can be incredibly beneficial for you because it contains antioxidants and has insulin-regulating properties. This delicious summer veggie is perfect in smoothies for adding extra hydration, sweet antioxidants, and beautifying nutrients. They’re chock full of silicon, a mineral necessary for building shiny hair, glowing skin, and strong nails. They also contain some potassium to help with electrolyte balance since you tend to sweat more in the summer and lose lots of your healthy minerals. Make sure to buy organic so you can eat the skins, which are a great source of vitamin C (another important component for healthy skin, not to mention immunity!) and chlorophyll. Well that’s all for today friend! If you’re looking for more awesome smoothie inspiration then make sure you download my FREE Sensational Smoothies E-Book by clicking here. I hope you have a wonderfully whimsical weekend!